So much can change in tennis over the course of just a couple of months. Even more can happen over the course of a year. To try to predict what might happen in five years time is arguably almost impossible. In the last few days, an old prediction made by L'Equipe has surfaced again and has been fairly widely mocked for how bad it has turned out. Their prediction, made in 2013, was for the top 10 ranked players at the end of 2018. As the image above shows, just two of their predicted players ended up in the actual top 10, with 6 of their picks not even ranked inside the top 50 in the world. Rather than just deriding their efforts, closer inspection suggests that some of the picks are not as ridiculous as they might seem. Grigor Dimitrov has never made it to #1, but if we go back twelve months, he had just reached a career high ranking of #3 and only dropped out of the top 10 in the world at the start of November. Were it not for injury, Andy Murray would almost certainly be ranked inside the top 10 and it would not have been a surprise if he was actually ranked at #3 behind Novak Djokovic and Rafael Nadal. Until his injury-problems, Milos Raonic spent the best part of three years as a top 10 player. Jack Sock has been dreadful in singles this year, but it is worth remember that it was only twelve months ago that he broke into the top 10 for the first time. There are admittedly some major misses in their list. Benoit Paire has barely even threatened the top 20, let alone reaching #2. If we are being completely honest, it is difficult to look back and even spot anything that might have suggested he would go on to achieve the success that L'Equipe expected. It is easy to suggest that Bernard Tomic's attitude problems were clear, even back in 2013, and maybe his current plight might not be all that surprising. Ernests Gulbis had just had a season where he raised his ranking from #138 to #24 with titles in Delray Beach and St Petersburg, a victory over Andy Murray and twice pushing Nadal deep into deciding sets in Indian Wells and Rome. He would start 2014 with titles in Marseille and Nice before that run to the French Open semi-final. That was obviously as good as it got and he seemingly lost interest in tennis after that, but again, it was maybe a slightly risky pick, but not completely ridiculous. Jerzy Janowicz has not even played a match this year, but having burst onto the scene with a final at the 2012 Paris Masters, a QF in the Rome Masters in 2013 and pushing Andy Murray in the 2013 Wimbledon semi-final to close the year just outside the top 20 at the age of 23, a top 10 prediction doesn't seem an absurd suggestion. Injuries have derailed his career, although whether he would have gone on to become a top 10 player, who knows. "It could well be that Roger Federer has played his last ever match as a top two player. His victory at Wimbledon was a glorious reminder of why we should not write him off, but could it be a final hurrah?" At the time, he had just dropped down to #7 in the world following a year where he had lost to the likes of Sergiy Stakhovsky, Daniel Brands and Federico Delbonis. To suggest that he would not still be in the top 10 five years later was not ridiculous. One assumes the exclusion of Nadal was based on the assumption that his body would have finally succumbed to the many injuries that he would suffer, although that has clearly not been the case. The exclusion of Del Potro is a slightly strange one though. At the time, he had been a fixture in the top 10 for almost 18 months. It seemed as though he had overcome his first wrist injury and whilst he might not have been looking as though he could return to the very top, a top-10 ranking seemed quite likely. However, overlooking the likes of Marin Cilic, John Isner and Kevin Anderson seems entirely plausible. Isner had generally lurked around the #20 spot in the rankings and would be 33 in 2018. 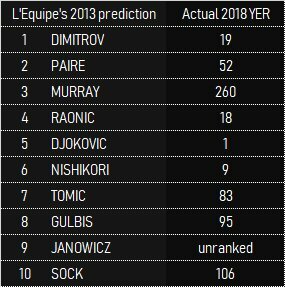 Cilic had never reached the top #10 and had just returned from a doping suspension - I suspect few would have predicted that he would become a fixture in the top 10 and a Grand Slam champion. Kevin Anderson had only just peaked at the #20 spot by late 2013 and there was little sign that he would become an established top 10 player at the age of 32 five years later. So, whilst it is easy to look at L'Equipe's prediction now and mock it, at the time, it may not necessarily have looked the worst prediction. If I remember correctly, the L'Equipe selection was widely mocked 5 years ago. Some of your points ring true but overall it came across as some lame attempt at trolling/getting attention. The maker of the list also overestimated the probability of large changes in player personalities and performance over 5 years, a mistake I think you avoided to some extent in your 2023 prediction.